In November 2016, a trial excavation was conducted at Kibbutz Allonim (Permit No. A-7828; map ref. 214052–127/735979–6069), prior to construction. 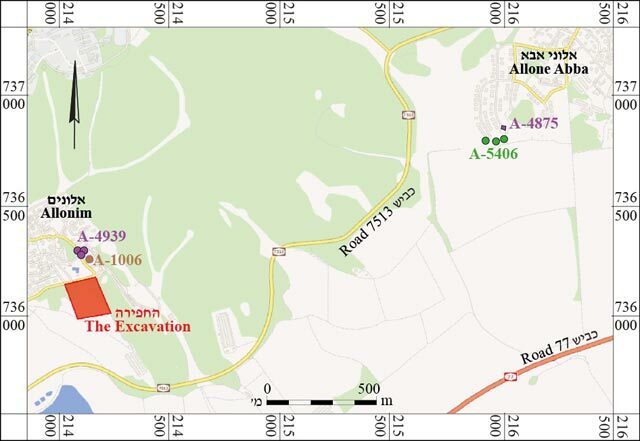 The excavation, on behalf of the Israel Antiquities Authority, was directed by R. Kapul (field photography), with the assistance of R. Liran (surveying), Y. Yaʽaqobi (administration), H. Tahan-Rosen (drawing of finds), A. Shapiro (GPS), Y. Gorin-Rosen (glass), I. Delerson (drafting), Y. Alexandre (pottery reading), K. Covello-Paran and Y. Tepper (scientific consultation), E. Bisharat and Y. Shalev (preliminary inspections), laborers from Kafr Manda and youth from the Upper Galilee Pre-Army Program at Maʽayan Baruch. The excavation was carried out in an agricultural area southeast of Kibbutz Allonim (Fig. 1). 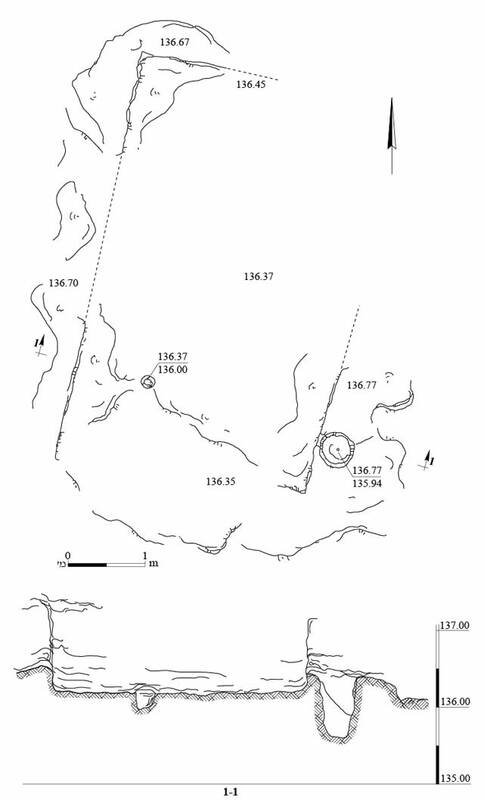 East of the kibbutz are the remains of Horbat Kuskus, which was documented in the survey of the Map of Nahalal (Raban 1982: Site 37) and identified with the ancient village of Ardasqus (Klein 1939:124). Several archeological excavations were conducted within the precincts of the kibbutz: buildings from the Hellenistic and Byzantine periods, ascribed to the ancient settlement of Ardasqus, were unearthed in the northwest of the kibbutz (Druks 1984); remains of a rock-hewn cellar from the Roman and Byzantine periods were discovered in the northeast of the kibbutz (Atrash 2015); buildings from the Early and Middle Bronze Age were revealed in Tel Be’er-Tivʽon, c. 0.5 km south of the kibbutz (Raban 1971); and in Allone Abba, c. 2 km northeast of Allonim, an industrial olive press of the Roman period, a winepress and a terrace wall were discovered (Porat, Frankel and Getzov 2012), as well as remains of a paved Roman-period road (Alexandre 2008). 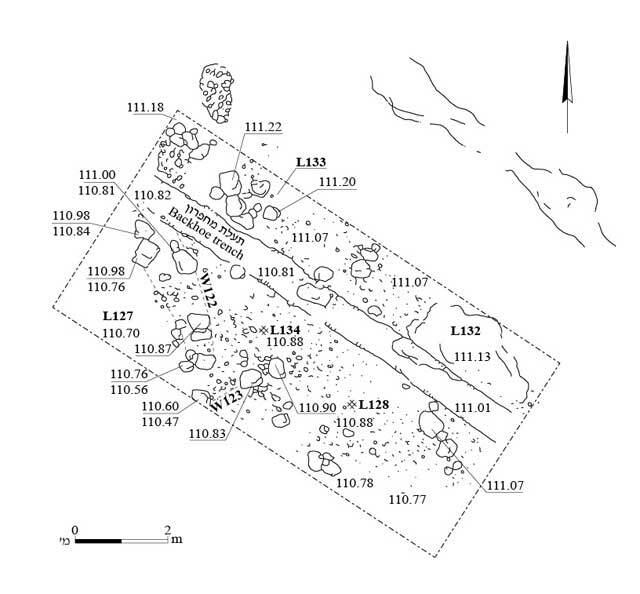 In the current excavation, seven squares were opened in three areas, where remains of a rural road from the Late Roman period (Areas A, B; Fig. 2) and an agricultural structure ascribed to the Late Roman–Byzantine periods (Area C) were revealed. A Taʽanakh-type winepress discovered north of the excavation area was documented as well. Rural Road. 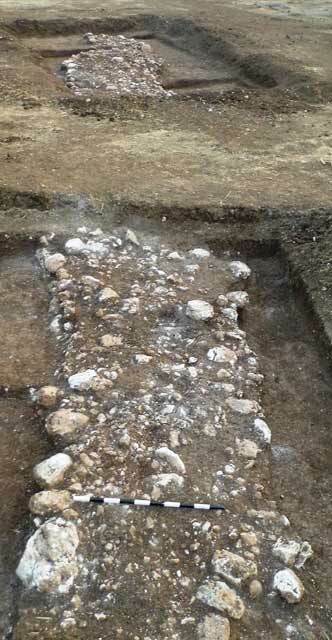 Remains of a paved rural road were discovered in Areas A and B. 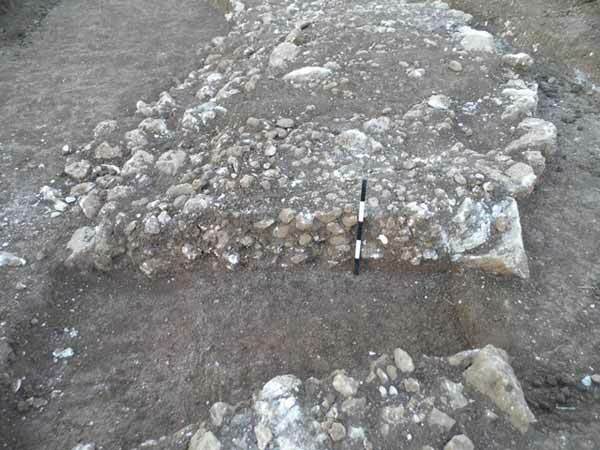 A tamped layer of stones was exposed in Area B, between two parallel rows of stones (L105, L116; exposed length c. 22 m, width 1.4–2.0 m, including the curb stones; Fig. 3) partly running along a winding route along a northeast–southwest direction. The curb stones were of various sizes (width c. 0.3–0.5 m, height 0.3 m), and several were coarsely worked on their outer side (Figs. 4, 5). 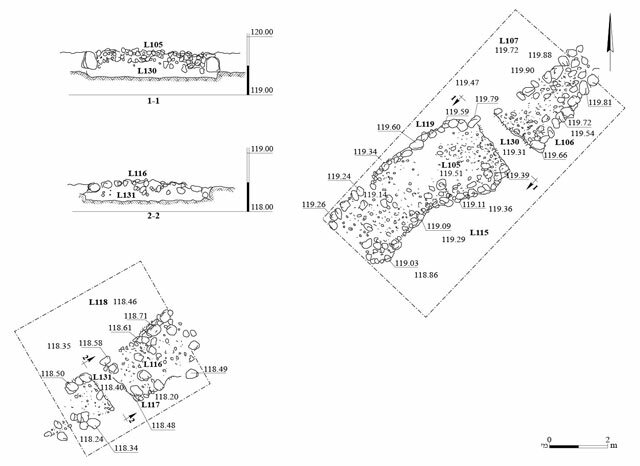 To examine its foundation, two sections (L130, L131) were excavated across the road in two locations, revealing that there was no roadbed beneath the small stones (Fig. 6). No evidence was found indicating that lime or any other bonding material was used between the stones, and no stones were discovered on either side of the paved area. Several pottery sherds from the late Hellenistic period, such as bag-shaped jars (Fig. 7:1, 2), were gathered from between the paving stones and along the side of the road. Most of the finds date from the Late Roman period. These include Kefar Hananya Type 1B bowls (Fig. 7:3) dating from the end of the second century to the mid-fourth century CE, Kefar Hananya Type 1E bowls (Fig. 7:4, 5) from the mid-third century to the early fifth century CE, a large bowl (Fig. 7:7) from the Late Roman period and a jar (Fig. 7:8) from the Late Roman period (third century CE). In addition, a Phocaean Red-Slipped bowl (Form 3; Fig. 7:10) dating from the fifth century CE was found, as well as a base of a glass bowl from the Late Roman period. A concentration of small and large fieldstones (L109; 0.9–2.4 × 7.6 m; Fig. 8) oriented in a northwest–southeast direction was exposed in Area A. Like the rural road in Area B, the small stones in the center of the concentration abutted in several spots large stones along the edges. A scant amount of ceramic finds from the Roman period was discovered on either side of the stone concentration. Due to the paucity of artifacts and the fragmentary remains, it was impossible to determine with certainty if this was indeed part of the rural road. Agricultural Structure. Remains of a structure comprising two very fragmentary walls (W122, W123; Fig. 9) built of a single course of roughly hewn limestone blocks (width 0.3–0.4 m, height 0.3 m) were uncovered in Area C. Tamped stone surfaces (L128, L134) abutted the walls. The finds sustained extensive damage due to modern plowing and a probe dug by a backhoe; nevertheless, it was possible to determine that the remains were of an agricultural structure, which had at least two walls and a level of small stones between them that served as a work surface. The pottery collected in Area C includes a large bowl (Fig. 7:6) and a krater (Fig. 7:9) from the Late Roman period, and a Phocaean Red-Slipped Bowl (Form 1; Fig. 7:11) from the Byzantine period (fifth century CE). An item made of mother-of-pearl (1.0 × 1.5 cm; Fig. 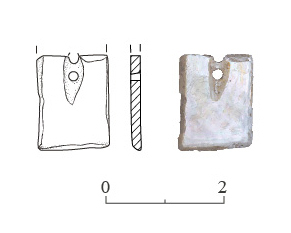 10) with a hole perforated at its end, probably a pendant or a button, was discovered on the surface; the object could not be dated. Winepress. A rock-hewn winepress, consisting of a treading floor (3.5 × 4.5 m; Fig. 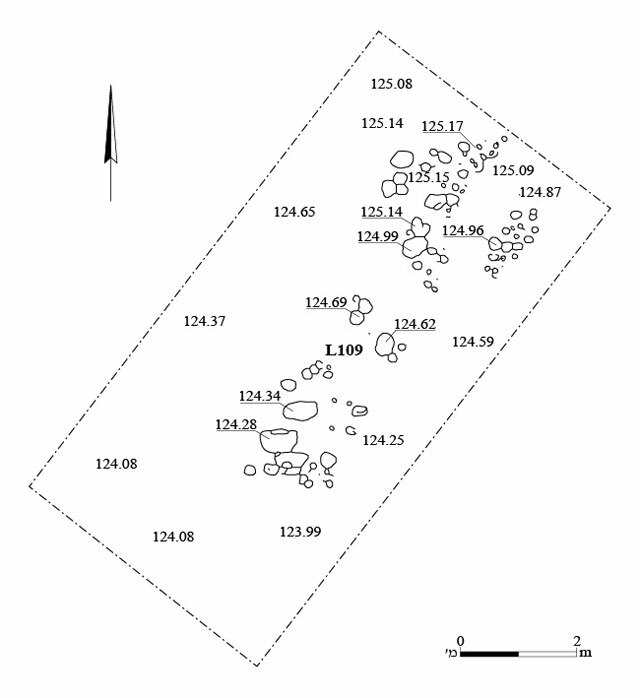 11) and a collecting vat (1.0 × 3.5 m) with a sump (depth 0.4 m), was identified north of Area A; it was not excavated. A cupmark (depth 0.8 m)—probably a base for a column which aided in the treading process—was discovered in the eastern part of the installation. Based on its characteristics, this is apparently a Taʽanakh-type winepress (Getzov, Covello-Paran and Tepper 2011). The winepress may have been part of the agricultural hinterland of the Middle Bronze Age settlement at Tel Be’er Tivʽon. 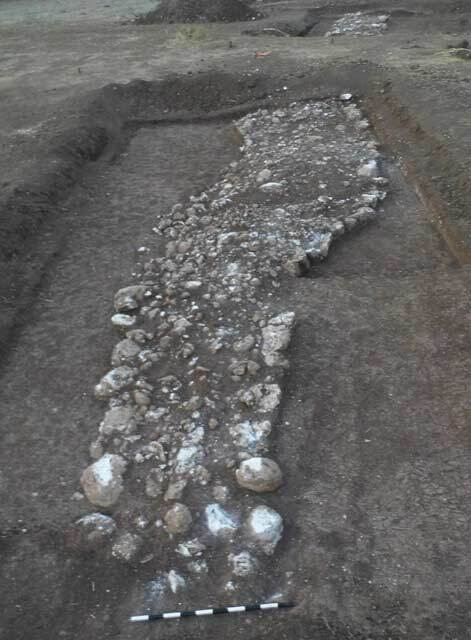 The excavation uncovered a paved rural road from the Late Roman period, which apparently led from the ancient settlement identified as Ardasqus to either agricultural installations that were used by the villagers or to surrounding villages. An almost identical road was discovered at the entrance to the settlement of Alone Abba (Alexandre 2008). It thus seems that in the Late Roman period there was a network of rural roads in the region that was probably established by the residents of the Jewish villages around Bet Sheʽarim and not as part of the official imperial road works (Tepper and Tepper 2004:32–38). The rock-cut winepress attests to ancient farming activity, which may have been part of an agricultural hinterland along the outskirts of the settlement at Tel Be’er Tivʽon. Alexandre Y. 2008. Alonēy Abba. HA-ESI 120. Atrash W. 2015. Alonim. HA-ESI 127. Druks A. 1984. Alonim. ESI 2:1. Getzov N., Covello-Paran K. and Tepper Y. 2011. The “Taanakh Winepress” – Evidence of the Middle Bronze Age Wine Industry in the Jezreel Valley. Eretz-Israel 30:145–155 (Hebrew; English summary). Klein S. 1939. Sefer Ha-Yishuv 1, Part 1. Jerusalem (Hebrew). Porat L., Frankel R. and Getzov N. 2012. The Lever Presses of Eretz Israel in the Light of the Alone Abba Oil Press. ʽAtiqot 70:51–81 (Hebrew; English summary, pp. 84*–86*). Raban A. 1971. Tel Be’er-Tivʽon. HA 39:15–16 (Hebrew). Raban A. 1982. Map of Nahalal (28) 16–23 (Archaeological Survey of Israel). Jerusalem. Tepper Y. and Tepper Y. 2004. Beth Sheʽarim: The Village and Nearby Burials. Tel Aviv (Hebrew). 3. 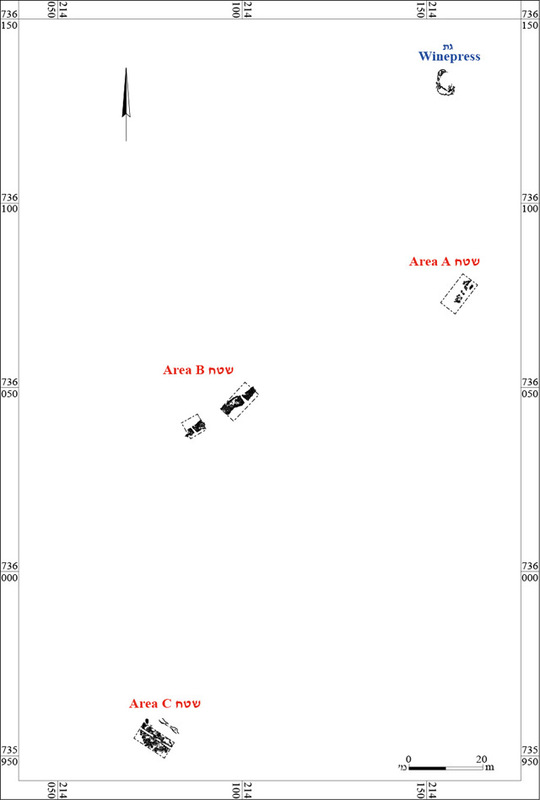 Area B, a rural road, plan and sections. 4. Area B, a rural road, looking south. 5. Area B, a rural road, looking north. 6. Area B, a cross-section of the rural road, looking north. 8. Area A, fragmentary remains of a rural road (?). 9. 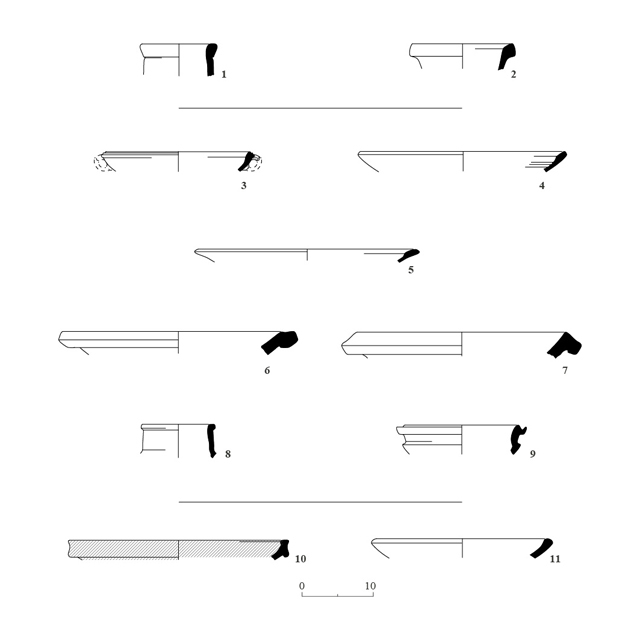 Area C, an agricultural structure, plan. 10. Area C, an item made of mother-of-pearl. 11. A Taʽanakh-type winepress, plan and section.